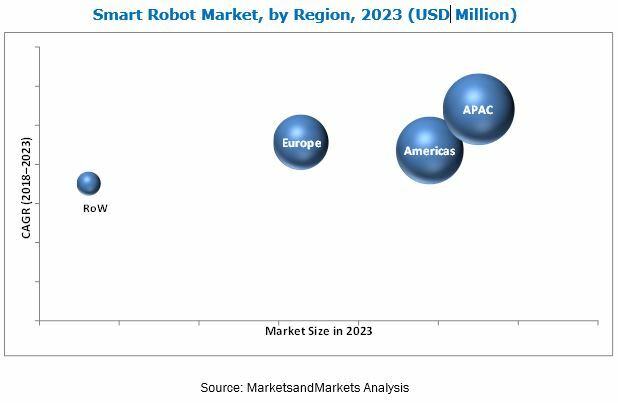 [157 Pages Report] The smart robot market is expected to grow from USD 4.12 Million in 2017 to USD 14.29 Billion by 2023, at a CAGR of 23.7% between 2018 and 2023. The smart robot market is mainly driven by the factors such as growing adoption of autonomous robots for professional services, emerging technological advancements in the field of robotics, increasing investments toward industrial automation, and growing government aid for R&D of AI-enabled robots. For this study, the base year considered is 2017, and the forecast period is between 2018 and 2023. The sizing of the smart robot market has been done using top-down and bottom-up approaches. The bottom-up approach has been employed to arrive at the overall size of the smart robot market from the revenues of key players (companies) and their shares in the market. Calculations are made on the basis of the number of smart robots used in each type of industrial and service application. Finally, the volume is multiplied by the average selling price of each smart robot to arrive at the overall market size. In the top-down approach, the overall market size has been used to estimate the size of the individual markets (mentioned in the market segmentation) through percentage splits from secondary research (including the study of associations, databases, and journals). Major secondary sources include the International Federation of Robotics (IFR), the International Journal of Robotics Research, the Robotic Industries Association, and the Association for Advancing Automation. For the calculation of specific market segments, the most appropriate parent market size has been used to implement the top-down approach. Key players in the smart robot market are SoftBank (Japan), iRobot (US), KUKA (Germany), ABB (Switzerland), Hanson Robotics (Hong Kong), Amazon.com (US), Honda Motor (Japan), FANUC (Japan), YASKAWA ELECTRIC (Japan), ECA (France), OMRON Adept Technologies (US), Samsung Electronics (South Korea), Intuitive Surgical (US), DeLaval (Sweden), Aethon (US), Rethink Robotics (US), Bluefin Robotics (US), GeckoSystems (US), BLUE FROG ROBOTICS (France), and Anki (US). All these companies have robust R&D facilities and extensive sales offices and distribution channels. The report provides the competitive landscape of the key players, which indicates their growth strategies in the smart robot market. The smart robot market is valued at USD 4.94 Billion in 2018 and is estimated to reach USD 14.29 Billion by 2023, at a CAGR of 23.7% between 2018 and 2023. The smart robot market is mainly driven by the factors such as growing adoption of autonomous robots for professional services, emerging technological advancements in the field of robotics, increasing investments toward industrial automation, and growing government aid for R&D of AI-enabled robots. The smart robot market is segmented on the basis of components into hardware and software. The hardware component is subsegmented into sensor, actuator, power source, control system/controller, and others. The other components include body material and other electronic, electrical, and mechanical components. The smart robot market for software is expected to grow at a higher CAGR during the forecast period. As technological advancements will lead to the growing complexity in terms of features such as inter-device connectivity, artificial intelligence (AI), and autonomous operations, the software segment is likely to get more importance than that of the hardware segment in the overall smart robot market as software will assist the complex functionalities to process efficiently and accurately. The smart robot market is segmented on the basis of industrial application into automotive, electronics, food & beverages, and others. The market for electronics applications is expected to grow at the highest CAGR during the forecast period. With the increasing complexity of manufacturing processes and miniaturization of semiconductor and electronics equipment, there is an increase in the use of AI-based smart industrial robots. Smart robots in the electronics equipment industry are used for designing and planning stages of the manufacturing process; thereby creating a huge potential for the growth of the smart robot market in the near future. The smart robot market is segmented on the basis of service application into personal and professional. The market for professional service applications is also expected to grow at a higher CAGR of 22.2% during the forecast period because of the increasing demand from defense and marine applications. Personal application is also expected to grow a significant rate due increase in demand for domestic, education and research, and personal assistance robots across the world. The smart robot market is broadly classified on the basis of geographic regions into the Americas, Europe, APAC, and RoW. The market in APAC is expected to grow at the highest CAGR during the forecast period. APAC is likely to adopt smart robots for almost all the major industrial and service applications during the forecast period. As the elderly population in APAC countries, such as China and Japan, is on the rise, the region is expected to employ humanoids for personal assistance and caregiving applications. However, the Americas held a major share of the market in 2017. The Americas is the early adopter of smart robots for all major industrial and service applications, thereby resulting in the maximum demand for robots from this region. High initial R&D expenditure inhibits the smart robot market growth. Furthermore, safety concerns due to complex high-level interfacing have been a key challenge faced by the industry. However, factors such as a rise in demand for personal services, adoption of IoT on a wide level, and huge potential in developing countries can generate significant opportunities for this market. Some key players in the smart robot market are SoftBank (Japan), iRobot (US), KUKA (Germany), ABB (Switzerland), Hanson Robotics (Hong Kong), Amazon.com (US), Honda Motor (Japan), FANUC (Japan), YASKAWA ELECTRIC (Japan), ECA (France), OMRON Adept Technologies (US), Samsung Electronics (South Korea), Intuitive Surgical (US), DeLaval (Sweden), Aethon (US), Rethink Robotics (US), Bluefin Robotics (US), GeckoSystems (US), BLUE FROG ROBOTICS (France), and Anki (US).